Sharon @ Stoughton – Postponed to Thursday, 4/26 at 3:45. Taunton @ Oliver Ames – Postponed to Thursday, 5/3 at 3:45. Stoughton @ Sharon – Postponed to Thursday, 4/26 at 3:45. Attleboro @ Taunton – Postponed to Tuesday, 5/1 at 7:00. Canton @ North Attleboro – Postponed to Tuesday, 5/1 at 3:45. Stoughton @ King Philip – Postponed to Thursday, 4/26 at 3:45. Sharon @ Oliver Ames – Postponed to Tuesday, 5/29 at 3:45. Taunton @ Attleboro – Postponed to Thursday, 5/10 at 3:45. North Attleboro @ Canton – Postponed to Thuesday, 5/3 at 4:00. King Philip @ Bishop Feehan – Postponed to a date and time to be announced. Oliver Ames @ Sharon – Postponed to Tuesday, 5/29 at 5:15. King Philip @ Mansfield – Postponed to Thursday, 4/26 at 3:45. Mansfield @ King Philip – Postponed to Thursday, 4/26 at 3:45. Oliver Ames @ Taunton – Postponed to Tuesday, 5/8 at 3:45. Taunton, 3 @ Dighton-Rehoboth, 0 – Final – Gage Kingman had 15 digs and 13 service points to help Taunton notch a 3-0 (25-14, 25-10, 25-9) win over Dighton-Rehoboth. Collin Hunter and Lens Esquil paced the Tigers with nine kills apiece while Lance Law finished with seven kills. Milford @ Sharon – Postponed to Thursday, 4/27 at 3:45 at Milford HS. North Attleboro, 9 @ Canton, 7 – Final – North Attleboro senior Owen Costello broke a tie game with less than three minutes to play in the fourth quarter and Big Red tacked on a final goal in the final seconds to edge Canton in a Davenport showdown. North jumped out to a 4-0 lead but Canton fought back to cut it to 5-3 at half. Goals from Matt Martin and Ryan Lodge in the third quarter tied the game for the Bulldogs. North Attleboro took a 7-6 lead into the final quarter. Canton tied it up before the Rocketeers scored the final two goals. Colin Young led Big Red with three goals, Zach McGowan had two goals and an assist and Tommy Lindstrom scored once and had three assists. Jack Dakin, Jason McNeany and Costello each scored once. Dan MacDonald made 12 saves for the Rocketeers. For Canton, Dan Dillon scored twice and had three assists, Martin (two goals) and Lodge (one goal, one assist) had had two points, Kevin Albert scored once and had one assist and Griffin Roach notched two helpers. Mike Shaw (goal) and Charlie O’Connor (assist) each had a point while freshman Jack Connolly made 13 saves. Franklin, 15 @ Mansfield, 1 – Final – Franklin sophomore Jacob Alexander dominated at the face off X, Connor O’Rourke and the Panthers defense pitched a shutout in the second half and four different players scored at least twice in the Panthers’ big win. Alexander won 16 of 17 face off attempts while O’Rourke made seven saves. The Panthers defense had a lock down effort in keeping Mansfield to its lowest output of the year. Eric Civetti had five goals and one assist, Packie Watson had two goals and two assists, Chase Tanner scored twice and had one helper and Nitin Chaudhury found the back of the net twice. Attleboro, 9 @ Taunton, 12 – Final – Delaney Powell scored five goals, as Taunton wins the Kelley-Rex battle with Attleboro. Alana Tavares followed up a 13-goal game on Monday with a hat trick and Abbey Kingman added three as well for the Tigers. The Bombardiers were led by Kyra Lyons’s four goals and Mish Logie added three in the loss. North Attleboro, 16 @ Canton, 6 – Final – Kenzie Rosenberg paced the Rocketeers to a big Davenport victory with seven goals, while Katie Lindstrom had a hat trick and Emily Schromm had five draw controls for North. Mansfield, 4 @ Franklin, 15 – Final – Eight different players found the back of the net as Franklin bounced back from its first loss of the season with a key division win. Jordan Jette had two goals and two assists, Kelsey MacCallum netted a hat trick and Nicole Houlihan scored twice for the Panthers. Head coach Kristin Igoe Guarino praised the defensive work of Grace MacCallum, who forced three turnovers and had five draw controls. 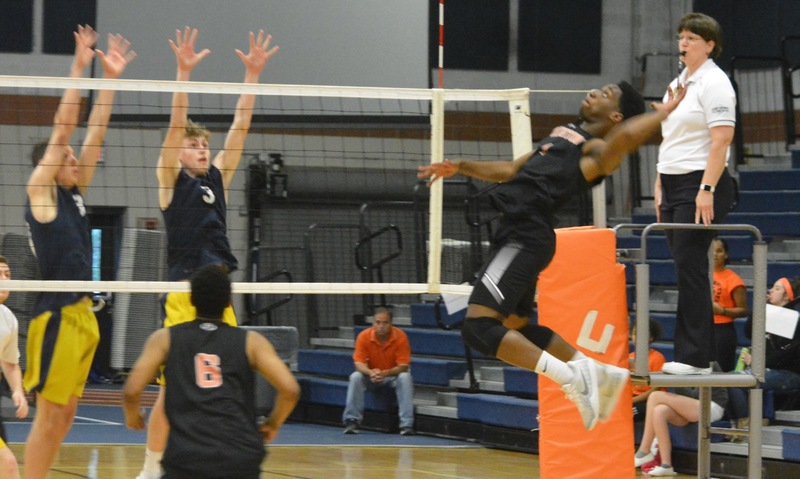 Taunton, 3 vs. Brockton, 1 – Final – After splitting the first two games, Taunton pulled out two straight wins to knock off Brockton (25-22, 13-25, 25-19, 25-22). Lens Esquil had 13 kills and a block while Lance law had 18 digs, 10 kills, three blocks and an ace. “Lance played well all-around,” head coach Toby Chaperon said. Chaperon added that Gage Kingman (16 digs) played well in the back row for the Tigers.